Blog Home » Vitamin Benefits » Can Vitamin D Help Your Child’s Eczema? 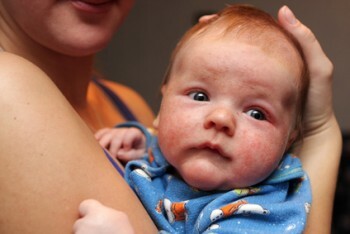 Parents of children with eczema know how debilitating such a skin disease can be. Eczema in children is a chronic allergic skin condition, leading to pain, inflammation, and an absolutely maddening itch. Rates of eczema in the United States alone have tripled over the past thirty years and currently affect almost 20 percent of American kids1. Many parents are desperate to find relief for their children. There is no known cure for eczema, so the best you can do is manage the symptoms. Eczema causes the skin of the patient to react abnormally when irritants are present. Many things are known to bring on an attack, such as foods, mites, pollen, and dust. These irritants cause the skin to become red, flaky, sensitive, and extremely itchy. Children and adults with eczema are also more prone to skin infections. The cause of eczema is not currently known, although it is considered by doctors to be caused by a combination of genetic and environmental factors. Some exciting new research has strengthened the connection between eczema and vitamin D levels in the blood. The new research, performed in a cross-sectional study on children with eczema, has shown that vitamin D levels are directly connected to the severity of eczema. A team of researchers in Turkey conducted a cross-sectional study into 74 children with eczema. At the outset of the experiment, each of the children had an average vitamin D level in their blood. Skin tests were conducted to check for the allergic sensitivity that is a hallmark of this chronic skin condition. At the same time, the researchers grouped the children by the severity of their eczema: mild, moderate or severe. In children with skin that had an allergic reaction, there was an inverse correlation between vitamin D levels and the severity of the eczema. This means that the lower the vitamin D level in the blood, the more severe the child’s eczema was2. If your child is suffering from eczema, he or she may benefit from supplementation with vitamin D. While it may take several months for positive effects to manifest, starting a vitamin D supplementation regimen may just be the thing that can help improve your child’s eczema. 1Boguniewicz M, Leung D. Recent insights into atopic dermatitis and implications for management of infectious complications. J Allergy Clin Immunol. 2010;125:4–13. 2Akan A, et al. Vitamin D Level in Children is Correlated with Severity of Atopic Dermatitis but Only in Patients with Allergic Sensitizations. Pediatr Dermatol. 2013 January 7; doi:10.1111/pde.12058.